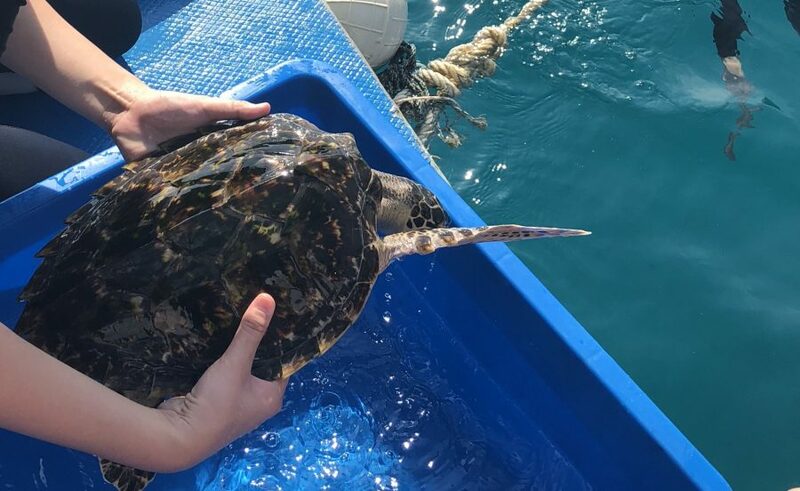 13 year-old Caitlyn Tan, a Roots & Shoots volunteer, shares the touching story of the attempt to rehabilitate a handicapped sea turtle – and the life changing lessons that came with it. Everyone is aware of pollution. Everybody knows about turtles dying and birds getting stuck in oil and such horrible happenings. Everyone knows about it, few do anything about it, and even less see or experience it, blissfully ignorant that such things exist. Far far away. I am ashamed to say I was one of those people. Although I had seen a bit, and would get very angry, and believed very strongly in animal rights and saving the world and all the things idealistic teenagers believe in, I am only thirteen and had never seen such things for myself. My friend and I went to Redang, Terengganu, for a turtle talk by SEATRU (an amazing organisation that protects turtles and the sea), plant some coral and learn about turtles. SEATRU stands for the Sea Turtle Research Unit of Universiti Malaysia Terengganu (UMT). The unit had its beginnings in 1984 when research on the leatherback turtles of Rantau Abang was first initiated by the then Faculty of Fisheries and Marine Science, Universiti Pertanian Malaysia. When I was told we were going to release a turtle, I was not informed of what condition it would be in. When I saw him (for I was told it was a him), I was absolutely horrified. 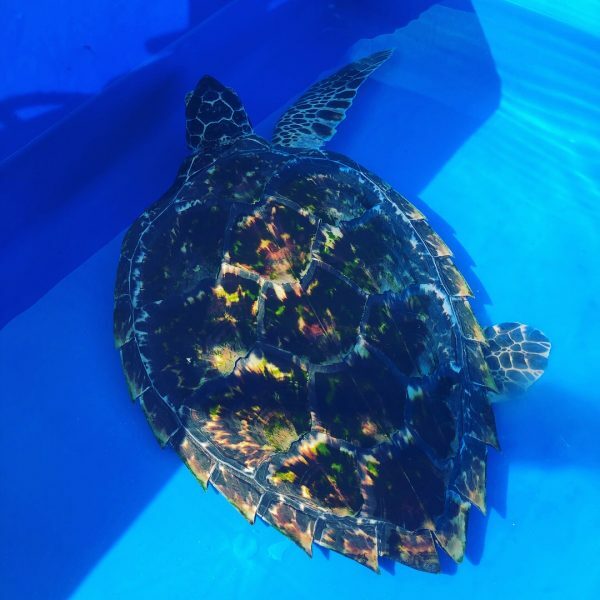 Nabil, a hawksbill turtle, was missing both the front and back flippers on his left side. He was essentially missing the turtle equivalent of an arm and a leg. Lucky for him, SEATRU had rescued and rehabilitated him, and I dare not think of what would have become of Nabil if they had not. Nabil lost both flippers on his left side after getting caught in a net. Nabil had been rescued eight months earlier and gets a lengthy, supervised swim in the ocean every day and was doing so well that SEATRU had deemed it safe to attempt a release into the ocean. Nabil was indeed an incredibly resilient turtle, and, under the care of SEATRU was nearly as hale as a turtle who had all its flippers. At first I naturally assumed that a shark or some other ocean predator had torn off Nabil’s flippers. But I had assumed incorrectly. Nabil had been stuck in a net and the owners of said net had cut his flippers rather than cut the net. It was the equivalent of taking a human child and cutting off their arm and their leg. He would have died if SEATRU hadn’t rescued him. At first I was rightly furious at whoever these people were, but later I reasoned with myself. It wasn’t really their fault. They did not know the hawksbill sea turtle was a critically endangered animal, or that turtles had feelings, and they needed their net to fish; they probably did that for a living, it was probably all they had to sustain themselves and their family. It is because of lack of education did they commit, perhaps unwittingly, such an abhorrent act. It is because of lack of knowledge that I am now writing this, to inform you that such things happen and such things happen frequently. Perhaps this is common knowledge to you, but there are millions of people that are in the dark and it is our job to inform them. We need to do something. We CAN make a difference. In fact, just giving up plastic straws already makes a difference (you can get metal or glass straws or alternatives) chastising friends for using unnecessary plastic things makes a difference; turtles eat plastic bags thinking its jellyfish if you are not already aware. When we were attempting to release NabiI, we went to a slightly deeper part of the ocean that Nabil had never ventured to before, but he seemed ready. I lowered Nabil into the water and soon dove in after him. The two stubs where his flippers once were, were moving frantically. But to no avail. Nabil getting ready for his first big swim. Immediately, he sank. He actually sank. I was terrified. Everyone was shocked; Nabil had never sank before. However, Nabil, being the fighter he was, soon rose to the top, although it was evident that he was exhausted in his attempt and was struggling greatly as he swam up for air, with his two flippers, and began swimming. His handicap made him, unfortunately, very slow, though, and he kept swimming to the surface of the water, where boats could potentially harm him. Unfortunately, it meant he would not be released. However, SEATRU is looking to make some 3D flippers for him; it is quite an expensive task and if you could donate or volunteer at SEATRU, that would make a huge difference.